The record is made up of 1 file (343 folios). It was created in 29 Oct 1927-10 Feb 1938. It was written in English and French. The original is part of the British Library: India Office The department of the British Government to which the Government of India reported between 1858 and 1947. The successor to the Court of Directors. Records and Private Papers. Correspondence, reports and other papers relating to the case of the SS Kara Deniz , a Turkish-owned steamship that was claimed as prize by the British Government at the moment of the Ottoman Empire’s entry into the First World War, while the vessel was moored at Bombay [Mumbai]. The papers focus on a financial claim made against the British Government by the vessel’s Greek owners, Socrates Atychides and Theodore Vahratoglou, based on the argument that the vessel had been sold to Persian owners before it was claimed as prize. The file includes: correspondence beginning in 1927 and exchanged between the Foreign Office, India Office The department of the British Government to which the Government of India reported between 1858 and 1947. The successor to the Court of Directors. 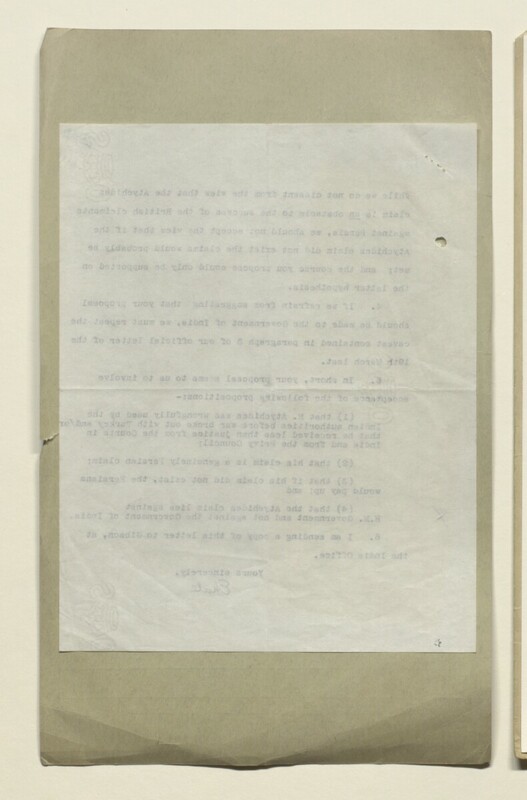 and Government of India, responding to the Government of Persia’s desire to conclude the claim being pursued by Atychides against the British Government; discussion of whether the Kara Deniz was detained prior to or after the Ottoman Empire’s entry into the War; accounts detailing the seizure of the Kara Deniz , including a 1928 note entitled ‘A brief account of the circumstances attending the alleged detention at Bombay of the S. S. “Kara Deniz” prior to her capture as a prize vessel in 1914’ (ff 323-330), and another note entitled ‘Diary of certain events relating to the detention of the S. S. “Kara Deniz” at Bombay in 1914” (ff 151-152); copies of correspondence (some in French) from Atychides; a printed copy of the court proceedings at the High Court of Judicature at Bombay, Admiralty and Vice-Admiralty Jurisdiction, entitled ‘Case No. 3 of 1914. In Prize. Steamship “Kara Deniz.”’ (ff 189-246); discussion of the claim in relation to other outstanding claims and disputes to be settled between the British and Persian Governments; a report prepared by HM Envoy Extraordinary and Minister Plenipotentiary at Tehran, Reginald Hervey Hoare, dated 1935, entitled ‘British claims against Persia’ (ff 84-109). Foliation: the foliation sequence (used for referencing) commences at the inside front cover with 1, and terminates at the last folio with 345; these numbers are written in pencil, are circled, and are located in the top right corner of the recto The front of a sheet of paper or leaf, often abbreviated to 'r'. side of each folio.